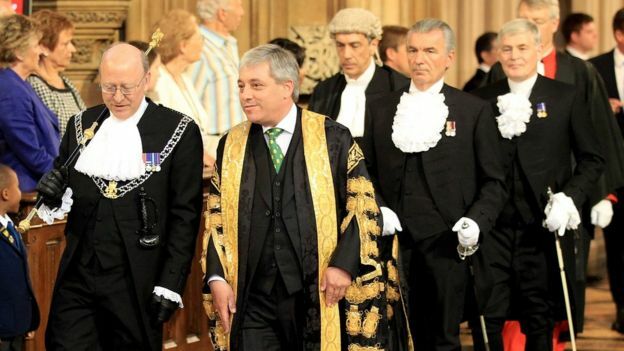 Commons speaker John Bercow outed as serial BULLY! A spokesperson for Prime Minister Theresa May has said that the allegations against Commons speaker John Bercow must be investigated after his former Private Secretary Angus Sinclair broke a confidentiality agreement to reveal that Bercow shouted and swore at him as well as threats of physical violence. Sinclair told Newsnight that he was subjected to angry rants from Bercow when working for him in 2009-10 - all of which Mr Bercow denies. He claims the Speaker would undermine him in front of other staff and, on one occasion, smashed a phone on his desk. Sinclair was given a payoff of nearly £87,000 and to sign a non disclosure agreement but felt he had no other option but to come forward. He said: "I thought to myself, it's in the public interest to know why I left. Yes, it breaks that non-disclosure agreement, but it's the truth. There was bullying." UK UNITY OPINION- Bercow is a smug, jumped up, overpaid, overpriviliged and untalented wretch. He symbolises everything wrong with Parliamentary Democracy and he should be sacked NOW! We are protesting outside Parliament on the 5th of June over Brexit, click here for more info! Read: "60 Tory Brexit supporters prepared to collapse Government over Customs Union sell out"
Read: "No wonder these Lords are so loyal to Brussels... They are being paid MILLIONS by the EU!"